Keita Wangari â€™14 got a masterâ€™s degree in human-computer interaction online from RIT. 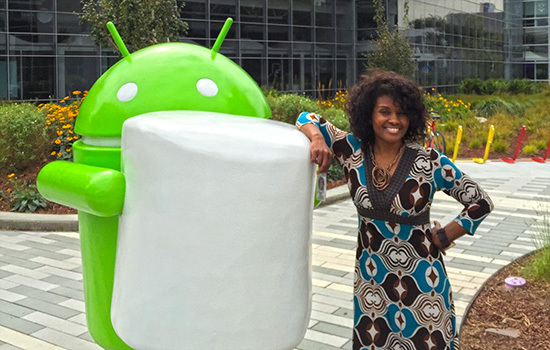 The degree helped her get a job at Google as a user experience researcher. Wangari lives with her family in Cupertino, Calif. There were bleary-eyed mornings when Keita Wangari had to tell her children that she had been up all night. After working a full day in sales operations and getting the kids ready for bed, the 40-year-old would spend the wee-hours of the morning researching search interface design as part of the human-computer interaction (HCI) master’s degree that she was completing online at RIT. Today, Wangari ’14 is doing just that. Living with her family in Cupertino, Calif., Wangari is a user experience (UX) researcher at Google, working with internally facing tools in the payment division. She was recruited for the job after publishing a paper as part of the thesis research she conducted at RIT. Wangari said that it’s not an overstatement to claim that getting her graduate degree online changed her life. Currently, more than 240 students from 13 countries are taking the same route and are enrolled in a fully online master’s degree program at RIT to open new doors in their careers, improve their salaries and advance their skills. RIT currently offers 17 fully online master’s degree programs. Among the most popular programs are the master’s degree in applied statistics and the highly customizable master’s degree in professional studies. Distance learning has long been a part of RIT’s culture, but the goal remains the same— to make learning more accessible to students. In 1979, the university began offering telecourses—classes conducted over TV—to employees at local companies looking to advance their technical skills. In 1991, RIT started a completely online master’s degree in telecommunications software technology that incorporated email and online discussion boards. Today, online master’s students can complete their degree full or part time and only pay 43 percent of the traditional tuition rate for most programs. Full-time students typically finish a program in about two years, while part-time students might take three to four years. New this year, RIT is offering online master’s programs in health care interpretation and health informatics. In 2018, the university will open an online graduate degree in data science. For Wangari, one of the most important outcomes of her master’s degree has been the lessons and opportunities that she has been able to provide for her kids. To learn more about RIT’s 17 online master’s programs, go to rit.edu/ritonline. RIT has partnered with more than 100 other top schools and organizations to offer online courses through edX. For more on how edX certificates can start a pathway to an RIT master’s degree, go to edx.org/micromasters.